When Mike's out-of-town guests requested to see some of DC's lesser known attractions, they helped him take another look at local attractions he'd been taking for granted. He cheerfully agreed to blog about this -- to encourage others to do the same! As someone who has lived in Maryland for close 20 years, I tend to never go to DC's national monuments section unless we are hosting out-of-towner's. Even then, I usually just drop them off at the Metro Station on the edge of the District so I can retreat back to air conditioning. This time my friends from California wanted to see Arlington Cemetery. For a year I attended school less than a mile from Ft. Myer, yet I never visited anything more than the Tomb of the Unknowns. 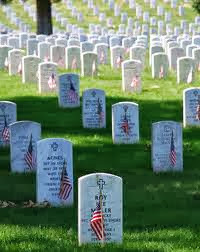 Many people know about this world famous, solemn and amazing place to respect American heroes. However, this time, I was lucky that these out-of-towner friends were more interested in the lesser known, unseen parts of DC. This helped me stop, take more time, and absorb nearly every sign and even a detour. It was a very hot, muggy day -- typical for early August. Thankfully, Arlington has a jump-off/jump-on tour bus that takes you to all key parts of the Cemetery grounds. The visitor center is newly renovated and a lot of interesting displays and pictures are displayed there now. Visitors get a pre-recorded description of surroundings as we drove through the rolling hills. I didn't realize there were so many various rules and standards for headstones over the years. Too many to try to tell you here though. First stop was the JFK, RFK burial sites. 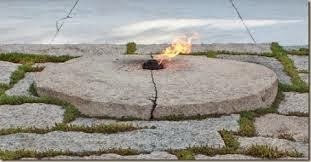 It was nice to finally see the Eternal Flame up close and not just a flicker out of the corner of my eye as I drove by the Pentagon. I really liked the Cemetery's request for silence and respect as you approach sacred spots like JFK and RFK's final resting place. The Tomb of the Unknowns was amazing as always. I was drenched with sweat by this point in the muggy August heat. I was humbled though thinking about how hot the perfect soldiers must feel with their full service dress uniforms, with thousands of people watching them each day. But wow...what an honor to be one of these elite guards looking over the Tomb and seemingly over Washington DC. The next and most arguably best part of our trip was a detour only we took. Arlington House had already closed for the day, so we couldn't go inside the main attraction building. The tour bus driver encouraged all of the 30+ visitors to still give Arlington House a visit, but only we took him up on the offer. The bus drove away and it felt like we weren't at a world famous cemetery but instead were at a forgotten, sort of eery graveyard and garden. When you get off the bus, you're greeted with unkept gardens, and a lot of overgrown trees and bushes. I sort of liked it though. I had always wondered what these well-manicured places would look like if the gardner stopped tending to them. We never found out why it was neglected. But it felt like our own private place to explore with only a few other visitors and no Cemetery employees or grounds crews. It was very quiet, and high above the Cemetery and Washington. The most amazing part was walking behind the Arlington House to see its incredible vista of D.C., which I suspect few see for themselves. The Tomb, of course, also has a great view of The National Mall, but this one was jaw-dropping and really put the icing on the cake. Our Arlington trip was nice for someone as hyper and quickly bored as myself to instead stop and smell the roses, go off the beaten path a bit, and absorb some history. It was all thanks to my out-of-town friends and taking a day off work. I highly recommend visitors take a few minutes to see Arlington House, whether the building is open or not. You will be happy you stopped! Tip #1: ANC Tours by Martz Gray Line provides an interpretative tour bus service through Arlington with stops at the John F. Kennedy gravesite, the Tomb of the Unknown Soldier, and the Arlington House (The Robert E. Lee Memorial). ANC Explorer is an app available from the Cemetery's website. Tip #2: The bus tours stop selling tickets past 5 pm on Sundays during the summer even though the cemetery itself is still open. Getting there: Arlington National Cemetery is located across the Potomac River from Washington, D.C. at the end of Memorial Avenue, the parkway which extends from Memorial Bridge, near the Lincoln Memorial. Along this parkway is the rotary intersection with the scenic George Washington Memorial Parkway. Arlington is accessible from the major roadways in the D.C. area like Interstate 95, the Capital Beltway (I-495), the George Washington Memorial Parkway and the Baltimore-Washington Parkway (I-295). Or, better yet, take the metro! Like the blog on Facebook: facebook.com/midatlanticdaytrips!